China Team, the only Chinese challenger for the America’s Cup to take place in San Francisco in 2013, is thrilled to announce that the crew to compete at the Naples AC World Series (April 7-15, 2012) is ready and have all arrived at the Serenity Marina in Sanya, the China Team base, to start training for the upcoming competition. Among the eight crew members, two skippers will be training on the recently acquired Ventilo M2 catamarans for the exclusive position of China Team skipper in Sanya. Fred Le Peutrec is a sailing veteran and one of the most experienced multihull skippers in the world. Fred has accumulated a number of world records, including the ‘Jules Verne Trophy’ (previously called The Race, around the world) three times (with Loick Peyron (2012), Franck Cammas (2010), Grant Dalton (2001)). Le Peutrec has been winner of the ORMA (trimaran) championships and has been in the top 3 on numerous occasions for World Championships and various multihull categories. The second skipper is a China Team member since 2011, Phil Robertson. At only 25 years old, Phil fronts WAKA Racing in New Zealand, a tight team of top young sailors, and has already won many major regattas. Robertson is currently placed eighth in the World Match Racing Tour rankings. In addition to this, he has placed in the top 3 in over 20 races in the past 2 years as skipper. Wang Chaoyong, chairman of China Team, says “We are fully committed to creating an environment for our sailors that will enable them to compete at the same level as their competitors. Training and practice is a key element of success and we will make sure that China Team sailors are ready for the upcoming races. 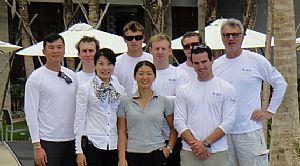 China Team’s international crew will be training in Sanya from March 14 to 29, 2012, and will be heading to Naples for the upcoming America’s Cup World Series, to compete against the 10 other teams which represent the challengers and the defender of the America’s Cup. Five years after China entered the America’s Cup race for the first time, it is back in the competition with China Team under the leadership of chairman Wang Chaoyong, and led by the 25 year America Cup veteran, Thierry Barot. This new challenger team will feature mainly Chinese sailors, on a China-built boat.